(V.31) “You shall make a partition.” A curtain was to be made to separate / distinguish the Most Holy Place (the Holy of Holies) from the Holy Place. The Tabernacle was a house for God’s Name (2 Samuel 7:13). Yahweh’s Name is to be sanctified – distinguished from other names, used only for holy purposes (Isaiah 29:23). Only Aaron and his descendents, wearing a head-piece that said “Holy to Yahweh,” were allowed to enter the Most Holy Place. “Aaron was set apart to sanctify (distinguish) Him as most holy, he and his sons forever, to burn incense before Yahweh, to minister to Him and to bless in His Name forever” – 1 Chronicles 23:13. 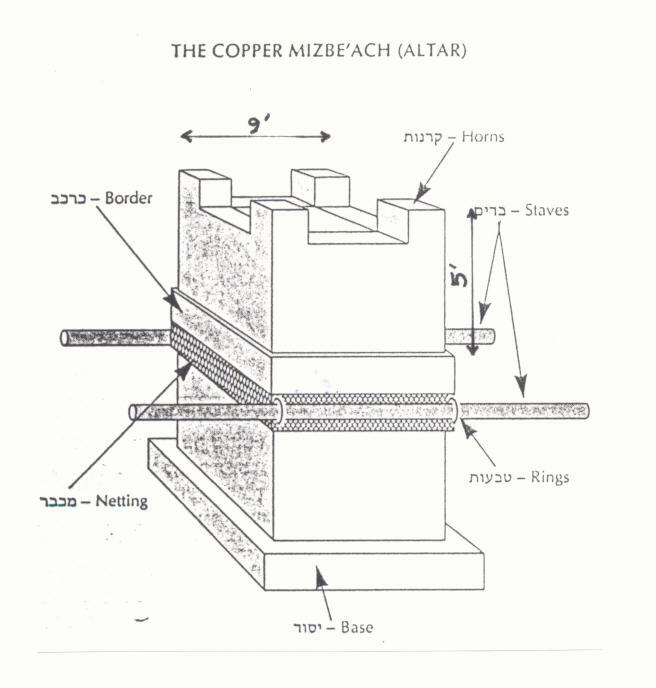 (V27:1) The Altar described here was called the Brazen Altar (because it was covered with copper), the Outer Altar (because it was located in the courtyard), or the Altar of the Elevation-offering (because no animal offering was valid unless at least its blood was brought to this Altar). We have moedim / appointments with God. There are appointed times: Sabbaths and Holy Days. There are appointed places: the Tabernacle (in time past), the Temple (when standing), and synagogues. In the title to this Psalm, Al Tashcheit means “do not destroy.” This is the second of three Psalms (57, 58, & 59) called Al Tashcheit, concerning how David disallowed his men to kill Saul (1 Samuel 24). A Michtam is a crown, and here is seen representing David’s noble conduct in dealing with Saul. (V.2) (Artscroll translation) “Is it true that you are silent? You should speak justice!” When the innocent are unjustly persecuted, the judges should stand up for them. (V.4-5) But the judges were corrupt beginning with all their thoughts; even evil thoughts of the heart require an elevation-offering to be brought! There were misuses of the Tabernacle, and its successor the Temple, and the offices thereof. The judges sat in the courtyard, to make halachic decisions (how to walk in fulfillment of Torah), and to judge between litigants. Both in Saul’s time, and in Yeshua’s time, there were corrupt judges. You fools and blind men; which is more important, the gold, or the temple that sanctified the gold? You blind men, which is more important, the offering or the altar that sanctifies the offering? Therefore he who swears by the altar, swears both by the altar and by everything on it. And he who swears by the temple, swears both by the Temple and by Him who dwells within it. And he who swears by heaven, swears both by the throne of God and by Him who sits upon it.” – Matt 23:16-22. The Tabernacle and Temple were the places where God met with man. They were holy – dedicated to God for worship only. To falsely swear, “as the Temple stands …”, is to swear by God who dwelt there, since that was its sole significance; otherwise, if no significance is acknowledged, why not just swear, “as the out house stands …”? And what is the significance of the gold of the Temple, beyond any other gold, except that it is part of the Temple? So, we must consider the significance of the terms we use. These “blind guides” would normally carry out logic from Torah passages to great lengths, but for themselves they forsook logic and used excuses. So what’s new? Do not we do the same? We need to ask God to show us what is in our hearts, and repent. 1 Then Yeshua spoke to the crowds and to His disciples, 2 saying: "The scribes and the Pharisees have seated themselves in the chair of Moses; 3 therefore all that they tell you, do and observe, but do not do according to their deeds; for they say things and do not do them. 4 "They tie up heavy burdens and lay them on men's shoulders, but they themselves are unwilling to move them with so much as a finger. 5 "But they do all their deeds to be noticed by men; for they broaden their phylacteries and lengthen the tassels of their garments. 6 "They love the place of honor at banquets and the chief seats in the synagogues, 7 and respectful greetings in the market places, and being called Rabbi by men. 8 "But do not be called Rabbi; for One is your Teacher, and you are all brothers. 9 "Do not call anyone on earth your father; for One is your Father, He who is in heaven. 10 "Do not be called leaders (masters); for One is your Leader, that is, Messiah. 11 "But the greatest among you shall be your servant. 12 "Whoever exalts himself shall be humbled; and whoever humbles himself shall be exalted. (1) for they broaden their totaphot (phylacteries – Deut 6:8), and lengthen the tzitzit (tassels – Num 15:38) of their garments. (4) and being called by men, Rabbi. Do not be called Rabbi; for One is your Teacher, and you are all brothers. This term is from Rabbim – a teacher of talmidim (disciples). The Talmudic Rabbi was an interpreter and expounder of Torah and Talmud, and had a separate occupation to derive his livelihood. The title “Rabbi” was originally honorary, the principle being that Torah must be taught free of charge. The fourteenth century shows the first evidence of salaried Rabbis, when the justification was to offset one’s loss of time (Jerusalem Encyclopaedia Judaica vol 13 pg 1445-6). Even beyond “teacher,” Rabbi usually represents a halachic judge – one who makes rules for congregants to live by. Today’s offices of (Jewish) Rabbi and (Christian) Pastor are generally more contrary to Biblical ethics than even those offices to which Yeshua referred. Do not call anyone on earth “Father”; for One is your Father, He who is in heaven. This is not the term of familiarity, “abba” (daddy), but the formal term “Av” (Father), that is used for spiritual progenitors, such as Abraham, but also for contemporary leaders who establish doctrine (notably in Catholicism today). Do not be called masters / spiritual leaders; for One is your Leader, that is, Christ. Moses was a forerunner of Messiah (“a prophet like me” – Deut 18:15 & Acts 7:37), and the Bible indicates no such earthly office today. The ancient synagogue offices, and churches of apostolic time, had no hierarchy, but a division of responsibilities among officers elected from elders (those over age 50). This term may have been used for members of the Great Assembly – the Sanhedrin. The warning could then apply to those who “seat themselves in Moses’ seat” (Matthew 23:2. Whatever term (or lack thereof) may be used today, this should be taken as a warning for individuals who would take upon themselves to create halachic rulings – decisions for congregants: that is seating oneself in Moses’ seat. The Bible says, “Holy and Reverend is His Name” (Psalm 111:9). Now, many make excuses for using these titles. But the message here is not against only certain high titles: the base admonition of Yeshua is, we are “all brothers”, and should not seek to be “noticed by men” by our distinguishing garments or titles; rather we are to humble ourselves, recognizing our real position before a Holy God. Also, teaching Torah (Bible) or singing Psalms as a way to earn a livelihood is referred to as “using the Torah as a shovel”, which is forbidden by ancient rules of ethics (Pirkei Avot). This is contrary neither to the Levitical tithe, nor to Paul’s statement in 1 Timothy 5 about the laborer being worthy of his hire. The distinction, in part, is similar to the idea of humbling oneself and being exalted by others, or exalting oneself and misusing Scriptures as an excuse. A disciple should honor and help support one who teaches him, but one should not teach Torah for mundane gain (such as requiring a salary) or pretence of superior spirituality. Reader 1* Amen. 31 "You shall make a veil of blue and purple and scarlet material and fine twisted linen; it shall be made with cherubim, the work of a skillful workman. 32 "You shall hang it on four pillars of acacia overlaid with gold, their hooks also being of gold, on four sockets of silver. 33 "You shall hang up the veil under the clasps, and shall bring in the ark of the testimony there within the veil; and the veil shall serve for you as a partition between the holy place and the holy of holies. 34 "You shall put the mercy seat on the ark of the testimony in the holy of holies. Reader 2* Amen. 35 "You shall set the table outside the veil, and the lampstand opposite the table on the side of the tabernacle toward the south; and you shall put the table on the north side. 36 "You shall make a screen for the doorway of the tent of blue and purple and scarlet material and fine twisted linen, the work of a weaver. 37 "You shall make five pillars of acacia for the screen and overlay them with gold, their hooks also being of gold; and you shall cast five sockets of bronze for them. Reader 3* Amen. 27:1 "And you shall make the altar of acacia wood, five cubits long and five cubits wide; the altar shall be square, and its height shall be three cubits. 2 "You shall make its horns on its four corners; its horns shall be of one piece with it, and you shall overlay it with bronze. 3 "You shall make its pails for removing its ashes, and its shovels and its basins and its forks and its firepans; you shall make all its utensils of bronze. Reader 4* Amen. 4 "You shall make for it a grating of network of bronze, and on the net you shall make four bronze rings at its four corners. 5 "You shall put it beneath, under the ledge of the altar, so that the net will reach halfway up the altar. 6 "You shall make poles for the altar, poles of acacia wood, and overlay them with bronze. 7 "Its poles shall be inserted into the rings, so that the poles shall be on the two sides of the altar when it is carried. 8 "You shall make it hollow with planks; as it was shown to you in the mountain, so they shall make it. Reader 5* Amen. 9 "You shall make the court of the tabernacle. On the south side there shall be hangings for the court of fine twisted linen one hundred cubits long for one side; 10 and its pillars shall be twenty, with their twenty sockets of bronze; the hooks of the pillars and their bands shall be of silver. 11 "Likewise for the north side in length there shall be hangings one hundred cubits long, and its twenty pillars with their twenty sockets of bronze; the hooks of the pillars and their bands shall be of silver. Reader 6* Amen. 12 "For the width of the court on the west side shall be hangings of fifty cubits with their ten pillars and their ten sockets. 13 "The width of the court on the east side shall be fifty cubits. 14 "The hangings for the one side of the gate shall be fifteen cubits with their three pillars and their three sockets. 15 "And for the other side shall be hangings of fifteen cubits with their three pillars and their three sockets. Reader 7* Amen. 16 "For the gate of the court there shall be a screen of twenty cubits, of blue and purple and scarlet material and fine twisted linen, the work of a weaver, with their four pillars and their four sockets. 17 "All the pillars around the court shall be furnished with silver bands with their hooks of silver and their sockets of bronze. 18 "The length of the court shall be one hundred cubits, and the width fifty throughout, and the height five cubits of fine twisted linen, and their sockets of bronze. 19 "All the utensils of the tabernacle used in all its service, and all its pegs, and all the pegs of the court, shall be of bronze. Reader 8* Amen. 10 "I also clothed you with embroidered cloth and put sandals of porpoise skin on your feet; and I wrapped you with fine linen and covered you with silk. 11 "I adorned you with ornaments, put bracelets on your hands and a necklace around your neck. 12 "I also put a ring in your nostril, earrings in your ears and a beautiful crown on your head. 13 "Thus you were adorned with gold and silver, and your dress was of fine linen, silk and embroidered cloth. You ate fine flour, honey and oil; so you were exceedingly beautiful and advanced to royalty. 14 "Then your fame went forth among the nations on account of your beauty, for it was perfect because of My splendor which I bestowed on you," declares Lord Yahweh. Reader 9* Amen. 15 "But you trusted in your beauty and played the harlot because of your fame, and you poured out your harlotries on every passer-by who might be willing. 16 "You took some of your clothes, made for yourself high places of various colors and played the harlot on them, which should never come about nor happen. 17 "You also took your beautiful jewels made of My gold and of My silver, which I had given you, and made for yourself male images that you might play the harlot with them. 18 "Then you took your embroidered cloth and covered them, and offered My oil and My incense before them. 19 "Also My bread which I gave you, fine flour, oil and honey with which I fed you, you would offer before them for a soothing aroma; so it happened," declares Lord Yahweh. Psalm 58 (To be sung.) For the choir director; set to Al-tashheth. A Mikhtam of David. 1 Do you indeed speak righteousness, O gods? Do you judge uprightly, O sons of men? 2 No, in heart you work unrighteousness; on earth you weigh out the violence of your hands. 3 The wicked are estranged from the womb; these who speak lies go astray from birth. 4 They have venom like the venom of a serpent; like a deaf cobra that stops up its ear, 5 so that it does not hear the voice of charmers, or a skillful caster of spells. 6 O God, shatter their teeth in their mouth; break out the fangs of the young lions, O Yahweh. 7 Let them flow away like water that runs off; when he aims his arrows, let them be as headless shafts. 8 Let them be as a snail which melts away as it goes along, like the miscarriages of a woman which never see the sun. 9 Before your pots can feel the fire of thorns He will sweep them away with a whirlwind, the green and the burning alike. 10 The righteous will rejoice when he sees the vengeance; He will wash his feet in the blood of the wicked. 11 And men will say, "Surely there is a reward for the righteous; surely there is a God who judges on earth!" Reader 10* Amen. 1 Then Yeshua spoke to the crowds and to His disciples, 2 saying: "The scribes and the Pharisees have seated themselves in the chair of Moses; 3 therefore all that they tell you, do and observe, but do not do according to their deeds; for they say things and do not do them. 4 "They tie up heavy burdens and lay them on men's shoulders, but they themselves are unwilling to move them with so much as a finger. 5 "But they do all their deeds to be noticed by men; for they broaden their phylacteries and lengthen the tassels of their garments. 6 "They love the place of honor at banquets and the chief seats in the synagogues, 7 and respectful greetings in the market places, and being called Rabbi by men. 8 "But do not be called Rabbi; for One is your Teacher, and you are all brothers. 9 "Do not call anyone on earth your father; for One is your Father, He who is in heaven. 10 "Do not be called leaders (masters); for One is your Leader, that is, Christ. 11 "But the greatest among you shall be your servant. 12 "Whoever exalts himself shall be humbled; and whoever humbles himself shall be exalted. Reader 11* Amen. 13 "But woe to you, scribes and Pharisees, hypocrites, because you shut off the kingdom of heaven from people; for you do not enter in yourselves, nor do you allow those who are entering to go in. 14 "Woe to you, scribes and Pharisees, hypocrites, because you devour widows' houses, and for a pretense you make long prayers; therefore you will receive greater condemnation. 15 "Woe to you, scribes and Pharisees, hypocrites, because you travel around on sea and land to make one proselyte; and when he becomes one, you make him twice as much a son of hell as yourselves. 16 "Woe to you, blind guides, who say, 'Whoever swears by the temple, that is nothing; but whoever swears by the gold of the temple is obligated.' 17 "You fools and blind men! Which is more important, the gold or the temple that sanctified the gold? 18 "And, 'Whoever swears by the altar, that is nothing, but whoever swears by the offering on it, he is obligated.' 19 "You blind men, which is more important, the offering, or the altar that sanctifies the offering? 20 "Therefore, whoever swears by the altar, swears both by the altar and by everything on it. 21 "And whoever swears by the temple, swears both by the temple and by Him who dwells within it. 22 "And whoever swears by heaven, swears both by the throne of God and by Him who sits upon it. Reader 12* Amen. 23 "Woe to you, scribes and Pharisees, hypocrites! For you tithe mint and dill and cummin, and have neglected the weightier provisions of the law: justice and mercy and faithfulness; but these are the things you should have done without neglecting the others. 24 "You blind guides, who strain out a gnat and swallow a camel! 25 "Woe to you, scribes and Pharisees, hypocrites! For you clean the outside of the cup and of the dish, but inside they are full of robbery and self-indulgence. 26 "You blind Pharisee, first clean the inside of the cup and of the dish, so that the outside of it may become clean also. 27 "Woe to you, scribes and Pharisees, hypocrites! For you are like whitewashed tombs which on the outside appear beautiful, but inside they are full of dead men's bones and all uncleanness. 28 "So you, too, outwardly appear righteous to men, but inwardly you are full of hypocrisy and lawlessness.